Advantages of waterproof and weatherproof labels are that they are resistant to abrasion and are unaffected by changing climate as well. Further, they also bring about easy tracking, which in turn, makes it easier to handle massive amounts of goods being transferred from one place to another. Because of so many unique perceived benefits, waterproof and weatherproof labels, which were used mainly for labelling chemical and hazardous products, are now finding applications in the food and beverages, consumer goods, and pharmaceutical industry as well. This is primarily because of their durability which helps to improve the visibility of the brand logo and name of the company. A trend in the global waterproof and weatherproof labels market that is gaining traction is the use of foil on account of their ability to prevent moisture from entering and bringing down effects of other environmental conditions. Proving counterproductive to the global market for waterproof and weatherproof labels, on the flipside, is the rising use of surface printing, as it does away with the need for labels altogether. As per a study by Transparency Market Research, the global market for waterproof and weatherproof labels will likely rise at a steady CAGR of 5.0% from 2017 to 2025. At this pace, the market is slated to become worth US$23 billion by 2025 from US$16.09 billion in 2017. Depending upon end use, the main segments of the global waterproof and weatherproof labels market are the food and beverage, cosmetics and personal care, pharmaceuticals, automotive and mechanical parts packaging, chemicals, etc. Of them, the segment of food is slated to account for around 30.0% share in the overall market in the years to come. The segment of beverage trails the food segment in terms of market share. By the end of 2025, the revenue in the region will likely become US$4.8 billion. Depending upon the printing technology, the global waterproof and weatherproof labels market can be divided into thermal printed labels, digital printed labels, lithographic printed labels, and flexographic printed labels, and flexographic printed labels. The segment of digital printing, among them, is projected to hold around a quarter of the share in the waterproof and weatherproof labels market and register a CAGR of 5.2% between 2017 and 2025. From a geographic standpoint, Asia Pacific leads the global waterproof and weatherproof labels market. In the years ahead too, the region is slated to maintain its dominant position by registering maximum CAGR of 6.6%. The market is being driven mainly by China, which has a massive manufacturing sector. The explosive growth in modern retail outlets and the food industry in India and the rest of the region is also serving to underpin the growth in the market. North America is another key market for waterproof and weatherproof labels. The region is slated to see moderate growth in the upcoming years. The Middle East and Africa offer lucrative opportunities in the market as well, and will likely clock an impressive CAGR of 6.4% during the period from 2017 to 2025. Some of the prominent participants in the global waterproof and weatherproof labels market are Avery Dennison Corporation, Lintec Corporation, Bemis Company, Inc., UPM Raflatac Ltd, 3M Company, Herma Gmbh, Fuji Seal International, INC., PMC Label, Robos GmbH & Co. KG, Ahlstrom-Munksjö, LabTAG.com., Brady Worldwide, Inc., NFI Corp, Advanced Barcode & Label Technologies, Inc., Weber Packaging Solutions, Inc., and SYMBIO, INC. This report provides forecast and analysis of the waterproof and weatherproof labels market on global level. It provides actual data of 2016 along with estimated data of 2017, and forecast data up to 2025 in terms of revenue (US$ Mn) and volume (Mn Sq. Mt). The report also includes macroeconomic indicators along with an outlook on waterproof and weatherproof labels consumption pattern across the globe. It includes drivers and restraints of the global waterproof and weatherproof labels market and their impact on each region during the forecast period. The report also comprises the study of current issues with end users and opportunities for waterproof and weatherproof labels manufacturers. It also includes value chain analysis. In order to provide users of this report with comprehensive view of the market, we have included detailed competitiveness analysis and company players with their SWOT analysis and strategy overview. The dashboard provides detailed comparison of waterproof and weatherproof labels manufacturers on parameters such as operating margin, total revenue, product portfolio, and what we call ‘innovation scale’. The study encompasses market attractiveness analysis by product type, by material type, by printing technology, by end use industry and by region. The report includes consumption of waterproof and weatherproof labels and the revenue generated from sales of waterproof and weatherproof labels across the globe and key countries. By product type, waterproof and weatherproof labels market is segmented into non adhesive based labels and adhesive based labels. Non adhesive labels are further segmented into glue applied label, in-mold label, sleeve label and adhesive based labels are segmented as permanent and removable labels. By material type, waterproof and weatherproof labels market is segmented into Specialty Papers, Foil, Plastic and plastic is further segmented as Polypropylene (PP), Polyethylene (PE), Polystyrene (PS), Polyvinyl Chloride (PVC), Polycarbonate (PC), Polymethyl Methacrylate (PPMA) and Others (PET, etc.). By printing technology waterproof and weatherproof labels market is segmented digital printed labels, thermal printed labels, lithographic printed labels and flexographic printed labels. By end use industry waterproof and weatherproof labels market is segmented into food industry, beverage industry, pharmaceuticals, cosmetics & personal care, automotive & mechanical parts packaging, chemicals and others (security, etc.). Market numbers have been estimated based on extensive secondary and primary research, average pricing of waterproof and weatherproof labels by product type and the revenue is derived through regional pricing trends. Market size and forecast for each segment have been provided in the context of global and regional markets. The waterproof and weatherproof labels market has been analyzed based on expected demand. Prices considered for the calculation of revenue are average regional prices obtained through primary quotes from numerous regional waterproof and weatherproof labels manufacturers, suppliers, and distributors. All key end users have been considered and potential applications have been estimated on the basis of secondary sources and feedback from primary respondents. Country demand patterns have been considered while estimating the market for various end users of waterproof and weatherproof labels in the different regions. Bottom-up approach has been used to estimate the waterproof and weatherproof labels market by regions. Global market numbers by product type, by material type, by printing technology and by end use industry have been derived using the bottom-up approach, which is cumulative of each country’s demand. The same has also been validated from top-down approach. Company-level market share has been derived on the basis of revenues reported by key manufacturers. The market has been forecast based on constant currency rates. The report provides detailed competitive and company profiles of key participants operating in the Global market. 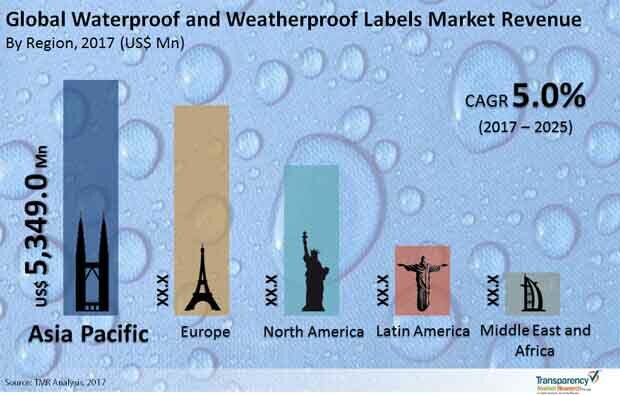 Key Players of the waterproof and weatherproof labels market are Avery Dennison Corporation, Lintec Corporation, Bemis Company, Inc., UPM Raflatac Ltd, 3M Company, CCL Label, Inc WS Packaging Group, Inc., Herma Gmbh, Fuji Seal International, INC., PMC Label, Robos GmbH & Co. KG, Ahlstrom-Munksjö, LabTAG.com., Brady Worldwide, Inc., NFI Corp, ZIH Corp, Advanced Barcode & Label Technologies, Inc., Weber Packaging Solutions, Inc., Thai KK and SYMBIO, INC.